When speaking, coaching people, or doing rewilding lifestyle workshops, I put forward the lifestyle of different hunter-gatherer societies all over the world. I explain how some of their ways can actually be implemented in your modern-day western society lifestyle as an antidote for the rat race we are all running to some degree. While I am a tiny bit of a gatherer (my lovely wife knows lots about plants and herbs), I am not a hunter. Over the years, I have been practicing stalking animals, mostly deer. While I wasn’t concerned with the quality of the picture, wildlife photography was my ‘hunting’. care at all about the quality of the picture, wildlife photography was my hunting was done. Taking the up-close picture was my aiming and shooting. During some of the bushcraft and survival training courses, I learned some survival and basic fishing skills. In the summer of 2016 I bought a Bearpaw Strongbow Traditional Star, an indestructible Strongbow fashioned after an English longbow. This is a bow which provides an entrance into the world of archery, offering a lot of fun and reasonable performance. 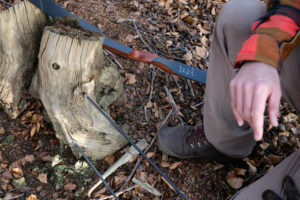 Because of its two inbuilt arrow rests (shelves), it can be shot by both right- and left-hand hunters. My son and I played around with it for a couple of months, having great fun. Shooting a bow and hitting the target makes you realize how difficult bow hunting must be. It gives you an idea about how much effort it takes to put the necessary amount of calories on the table when hunting and gathering. It’s definitely a different ballgame than going to the supermarket and filling up your shopping cart. The aiming and shooting itself requires both mental and physical self-control. Recently I decided to take it a step further. While not suggesting everyone should go out and hunt, I want to become (to some degree) a modern hunter-gatherer. The Eagle Archery Country Club is only a 20-minute ride from my home. For some archers, 3D archery, a shooting format in which archers walk a target course in the woods, or through fields – or both, is a gateway from hobby to actually becoming a skillful bow hunter. 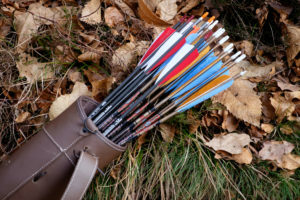 Although the life-size foam animals have a different scoring zone in competition, it is one of the best ways to learn how and where to place your arrow. My son and I became members of the club and are coached by Claude Dewinter, a seasoned bowyer. I also became a member of the Belgian bow-hunting Federation, where I hope to take part in a seminar and a bow-hunting course. In the meantime, I had spent some time on the internet finding out which bow would be my next one. I pretty soon found out that “the one best bow” doesn’t exist, and that every archer has a sort of a love affair with his bow. From the beginning I was attracted by the Bearpaw brand (I adore the name, the logo, the looks) and experienced archers of all kinds and backgrounds told me they were the best! Because of social-media friends we had in common, I got in contact with Henry Bodnik, the owner and boss of Bearpaw. Henry liked my adventures and expeditions, and also my rewilding lifestyle coaching. He kindly decided to support me and help me find my way in the world of archery. I appreciate so much that Bearpaw not only sponsors young archery talents, but also an explorer of several moons starting to discover a new territory: instinctive archery. After some chatting and explaining my motivations and future plans, we opted together for the 35-pound lefthander Kiowa Recurve to start with, concentrating on technique and posture before raising the power. 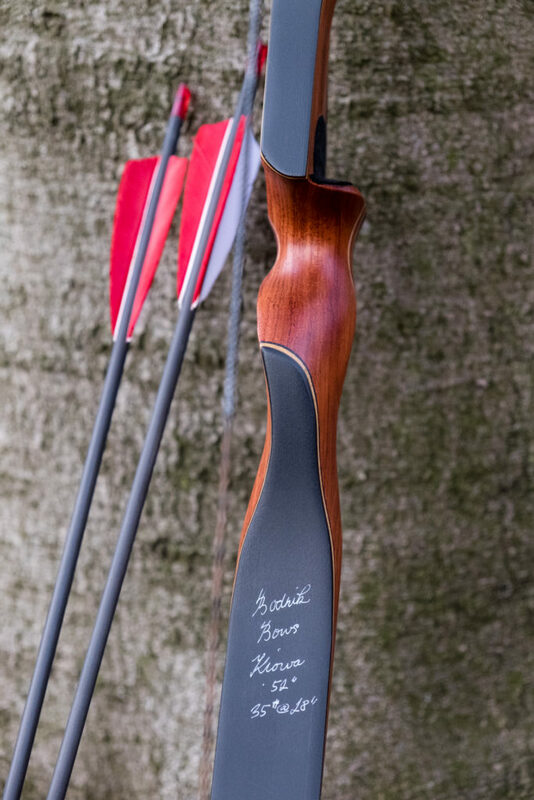 Henry Bodnik: “It’s a perfect bow for hunting because of its power and short length (only 52 inches long, approximately. 132 cm). I have also one for my own”. It can be drawn in a soft and comfortable way up to 30 inches. The Kiowa is a handy companion in difficult terrain, with an extraordinarily fast and swift shooting performance. Now I want to practice, practice, and practice more to become a better archer. Thank you, Bearpaw. Thank you Henry and thank you Eagle Archery Country Club and Claude Dewinter for supporting me in this new adventure. Try archery, guys! You’ll never ever regret it!